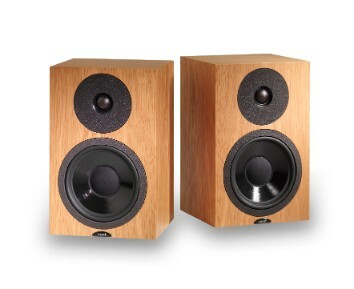 The PETITE SX is the latest development of a classic loudspeaker which began life in 1989. A small two-way bass reflex design, it is capable of exceptional bass extension and drive, and a remarkable presentation of all types of music. The main drive unit is the latest version of that used in the upmarket Ultimatum range; a 6.5” doped paper cone with a ferrite magnet assembly and vented voice coil to enable high power handling without compression. The tweeter used in the SX is a soft-fabric dome type with internal damping and a non-resonant chamber. The choice of tweeter is critical, because the tweeter lends the whole speaker its essential character and integrity. In this context, the tweeter’s strengths of superb dynamic contrast and accurate tonal colour are well matched to those of the main drive unit. The enclosure is rigidly constructed from MDF and is tuned by a rear firing reflex port. The internal crossover network uses highest quality close-tolerance components and all connections are soldered. Bi-wire connectors are provided, and further performance gains can be made with bi-amplified operation. The Petite is intended for placement on rigid stands and can be used close to walls or in free space. As with all Neat loudspeakers, the crossover is the result of painstaking development. Neat prefer to judge all aspects of tuning & voicing by ear, rather than referring to measurements. The crossover in the Petite SX is a simple, hard-wired 3–element type. Low-loss air-core inductors are employed, as well as high-grade polypropylene capacitors. All crossover components are specified to be within very tight tolerances in order to ensure excellent pair matching.